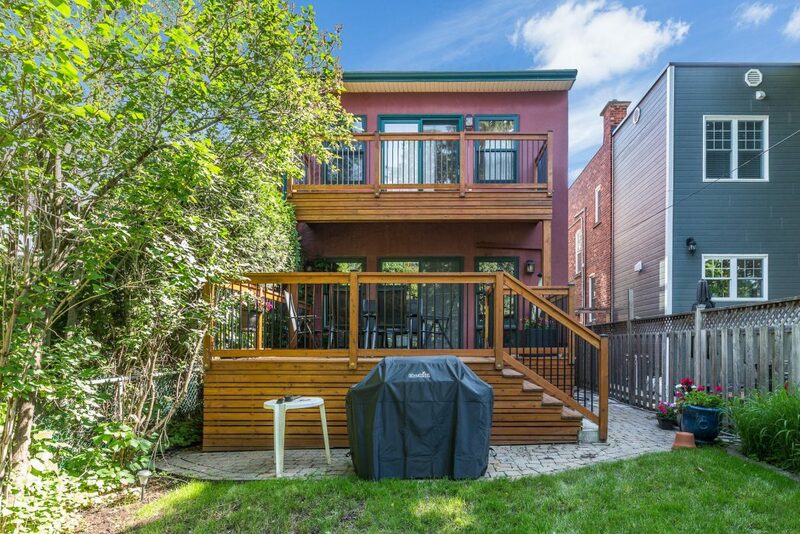 Discover this outdoor terrace construction project on a house in Saint-Laurent, Montreal. Take advantage of our experience as a general contractor in residential construction and our turnkey services! Call us today for a free consultation! This Saint-Laurent client wanted to add a balcony and an outdoor terrace at the back of his residence. He wanted to create a pleasant space that would allow him to spend time outside and have a beautiful view of the backyard. With the client, we chose a terrace anchored to the house and the roof would serve as a balcony for the second floor. Then, we laid a foundation of concrete pillars, installed the edge joist on the house, installed the posts and beams, the edge and intermediate joists and finally the floor. The client wanted to keep a more rural and rustic look with a treated wood floor and roof and wooden and wrought iron railings. 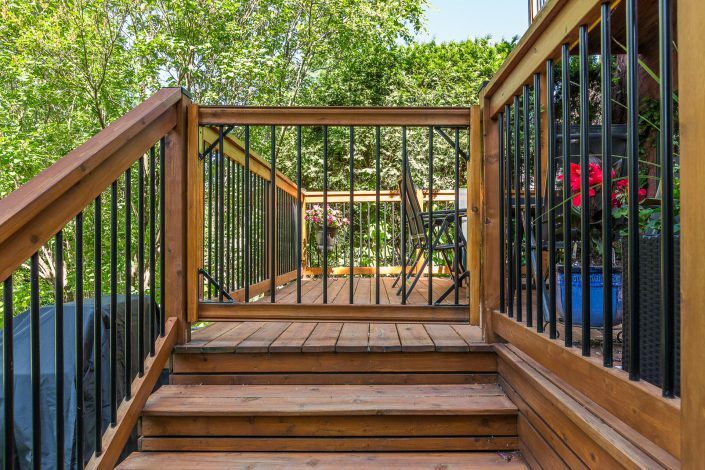 Since the client had young children, we added a lockable gate in front of the stairs. We placed wooden slats on the lower part of the terrace. As for the balcony, we used the same model of boards and railings as on the terrace to create a more harmonious layout. For a general contractor specialized in residential construction like us, it is essential to work with trusted partners such as building engineers, designers, landscapers and architects in order to realize your outdoor terrace construction project, regardless of its size. Your satisfaction is our greatest reward! 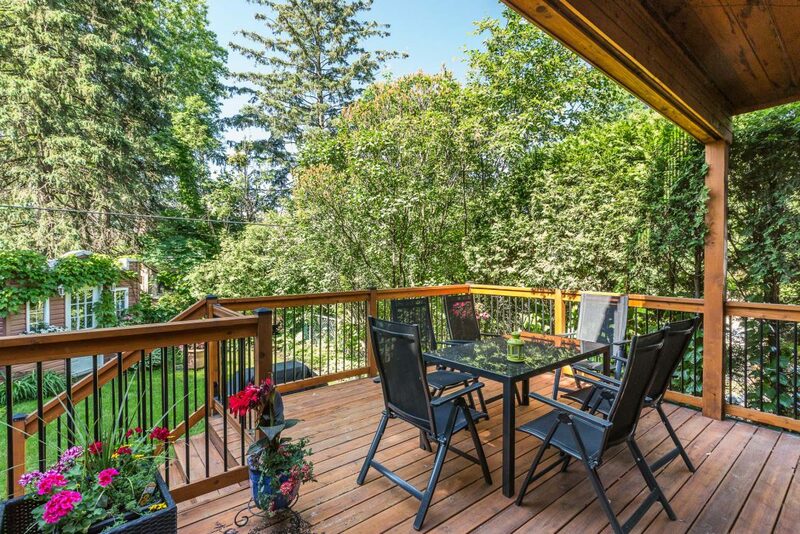 If you would like to know more about this residential terrace construction project in Saint-Laurent, our turnkey construction services, our prices, or our services, we invite you to contact us by email or by phone. Your first consultation is free of charge! Our team will be happy to welcome you and answer your questions.